Fender has collaborated with Chris Stapleton on a ’62 Princeton signature amp, inspired by a Brownface the country artist fell in love with early in his career. 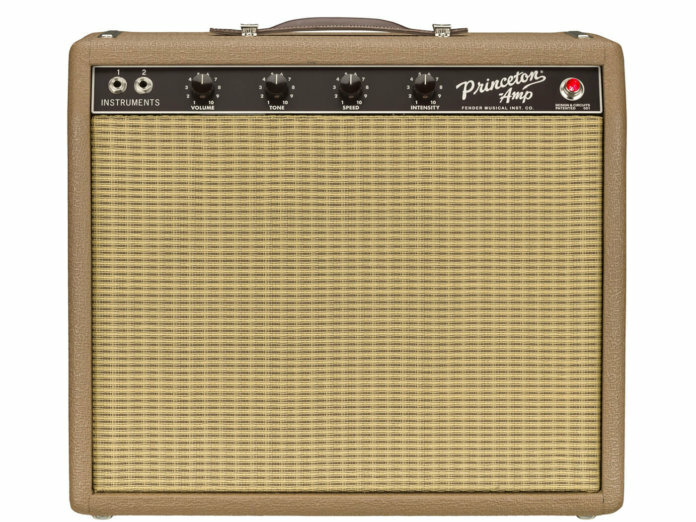 This 12-watt, 120-volt combo recalls the vintage designs of Brownface Fender amps – including a classic 6G2 circuit – but also adds sonic and aesthetic upgrades requested by Stapleton himself. These include an upgraded speaker and a smooth, organic tremolo. For the amp’s tube configuration, Fender has gone with two 12AX7 preamp tubes, two 6V6 power tubes, and a single 5V3 rectifier tube. Circuitry components consist of the brand’s Vintage “Blue” tone caps along with Schumacher transformers. The amp also features a tube-biased tremolo effect that can be conveniently toggled via a footswitch. This effect is shaped by speed and intensity knobs, while a master volume knob and a single tone knob control the amp’s overall sound. Elsewhere, the amp is loaded with the aforementioned custom Eminence 12-inch CS speaker, housed in a solid pine cabinet dressed in rough-brown textured vinyl. As an additional cosmetic touch, Stapleton’s signature is engraved on a brass plate on the amp’s back. Retails at $1,999. More info at fender.com.